Xilisoft DVD to MP4 Suite is a discount pack including 2 powerful programs: Xilisoft DVD to MP4 Converter and Xilisoft MP4 Converter. The latest Home DVD to MP4 converter software provides the conversion from Home DVD to MP4 and also allows you to convert Home DVD to AVI, XviD video formats, as well as extract audio like MP3, M4A from Home DVD movie with high conversion speed. Meanwhile, Xilisoft MP4 Converter gives you the ability of converting popular video formats such as AVI, MPEG, DivX, MOV, RM, WMV, 3GP, VOB, H.264/MPEG-4 AVC, DV, XviD, H.264/PSP AVC to optimized MP4 format for playback on Archos AV500, Archos AV700, Archos Gmini402, iRiver PMP-100, Creative Zen Vision, etc. One powerful Xilisoft DVD to MP4 Suite can serve almost all your portable digital devices! Free trial right now and fully enjoy your favorite Home DVD movie and videos with iPod, iPhone, PSP and more anytime anywhere. 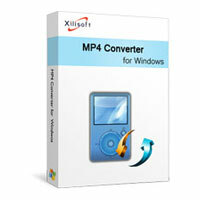 Xilisoft MP4 Converter is a powerful and easy to use MP4 video converter which helps you convert all popular video formats including AVI, MPEG, MOV, RM, WMV, 3GP, VOB, VCD, DV to MP4 videos for playback on iPod, Apple TV, PSP, PS3, and other MP4 players. Xilisoft DVD to MP4 Converter helps you convert home DVD to MP4, AVI, DivX video format that is playable on popular MP4 players such as Archos AV500, Archos AV700, Archos Gmini402, iRiver PMP-100, Creative Zen Vision, etc.